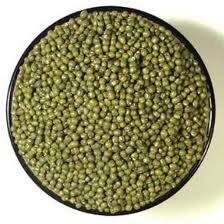 Moong Dal (in Hindi) is a bean variety. 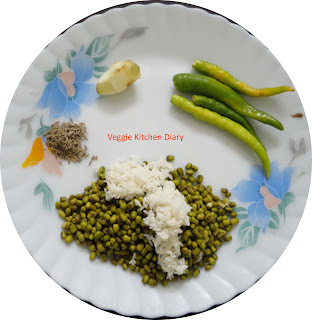 It is also known as ' Pesalu' in Telugu,‘Pachai Payaru’ in Tamil and as ‘Green Gram’ in English.Green gram is small green oval shaped gram and can be cooked after soaking or without soaking. You can make sprouts easily in this. Along with proteins and minerals, it contains adequate dietary fiber too. It is consumed as whole and in split form too. In south India, split green gram is used more in Poriyals and Kootu. There are some slimming guides which claim that Moong beans are the ultimate slimming food because it fits in very well with the food replacement programs that have become so popular with the public. The food is a low fat addition to the diet but it also contains the protein that enables the person to build their body cells and maintain a healthy lifestyle. It has been credited with the ability to lower cholesterol in the body and also stabilizes the blood sugar for those who are at risk of suffering from diabetes. 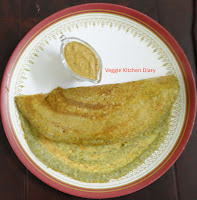 Pesarattu is a popular breakfast dish in Andhra Pradesh. 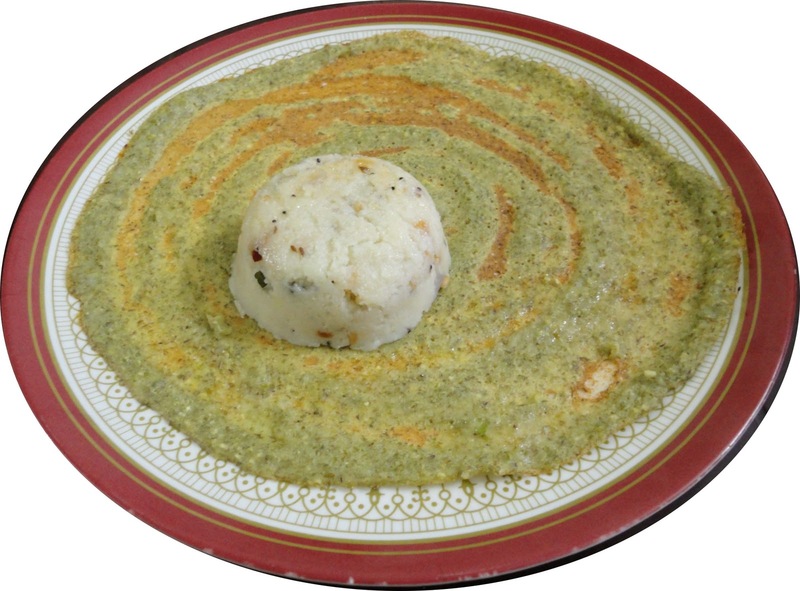 Traditionally it is served with a sprinkle of onions and fresh coriander on the inside, eaten with Allam Pachadi (Ginger Chutney)or Coconut chutney. This tastes best when freshly made and not a dosa you can stop at one :) Adding Upma on the inside adds to the taste to make the dosa more fulfilling that's is why it is called as MLA Pesarattu. 1. Soak rice and moong dal separately for 6 hours. 2. Drain water and grind them together smoothly along with green chillies,ginger and cumin seeds..
3. Mix salt with batter. 4. Chop onion and ginger into small pieces. 5. Heat dosa tawa till hot (if you sprinkle water it has to sizzle). 6. Pour a spoonful of batter in the center of the pan and spread it round in shape. 7. Add chopped onions and green chilies pieces for topping. 8. Add 1 tsp of oil/ghee on top and edges of pesarattu. 9. Lower the flame for 2 mts and then turn the flame to high. 10. Allow the pesarattu to turn on golden brown color at the bottom and then turn it back. 11. Allow pesarattu to fry for a minute and then turn it back again. Fold into two halves and serve hot with upma and ginger chutney. 2. In a sauce pan add oil and when it hot add the mustered seeds and let it splutter. 3. Now add all the other ingredients in the seasoning. 4. When the dals turn golden brown add the chopped onions and green chilies and saute it for 5 mins. 5. Now add water and salt to it and allow it to boil. 6. When the water boils nicely add the roasted rava and cook until it is done.